Travian Kingdoms is a browser based MMO that revolves around strategic PvP combat against thousands of other players, each player is responsible for building and developing their own village, constructing various buildings and training an army of troops to defend it. Travian Kingdoms is free to play, but players have an option of purchasing Gold premium currency for real money to gain access to various boosters and membership perks. 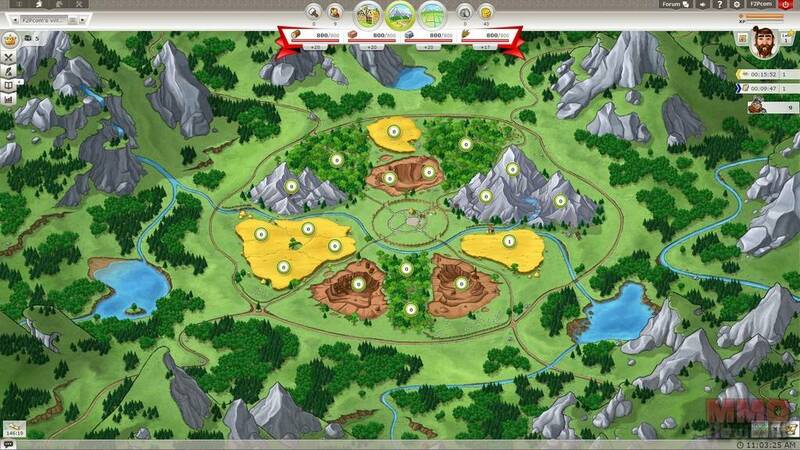 Travian Kingdoms is an empire building MMO, players can establish their village and try to expand their territory, creating an army to compete against other players and help their own kingdom, made up of other players, flourish to be the best. Kingdoms can forge Alliances and work together, ultimately working towards creating a World Wonder which will declare them the winners of the game, adding an actual end game objective instead of an endless battle to be the number 1 ranked player. Players get to choose from three historical factions: the Gauls, the Teutons and the Romans, each has its own unique military unit and Tribe Skill to help it in combat as well as features that will determine how the faction is best played ie. Teutons benefit an aggressive war-mongering type of player, Gauls the more defensive or new player and Romans the strategic experience player able to plan ahead. Resources are the backbone to the game, primary resources players must acquire are wood, iron, clay and crops, which are typically used to construct buildings, train units, research and pay for upkeep. They can acquire through the Resource Fields that players can develop as part of their village, through trade with other players and purchasing them on the market, completing quests as given by the NPC’s or through conflicts with enemy AI and other rival player villages. Players must establish their village and construct a variety of buildings that will give players new options, such as the Barracks will allow players to train up military units, the Embassy allows players to form Secrets Societies and Alliances, Markets allow players to trade resources and much more. Each holding once constructed can be upgraded to make it more superior and proficient in its task, including the players defensive walls which will increase their defensive capabilities when under attack. Early in the players are asked if they wish to fill the role of a Governor or a King, the choice they make will define their playstyle and activities a little more in how they help their kingdom. A Governors role is to provide for the kingdom and acquire Stolen Goods to give as tribute to the King, focusing more on economy and resources Governors are best suited towards newer players. Kings take a much more active leadership position and their primary role is organising the military element kingdom, focusing on defending the realm from its rivals. Robbers will set up Hideouts and Camps throughout the kingdom, if left undisturbed then they will begin to spawn enemy troops that will attack any nearby villages to steal their resources. Hideouts are only viewable by each individual player, so the Hideouts that they see on the map one be the same as what other players see, so they must deal with these threats on their own. However, Camps can be seen by all and can only be destroyed if successfully attacked by five different players. When successful players will recover resources from Robbers as well as Stolen Goods that, providing they are a Governor, they can give to their respective King. By default all players fall under a single kingdom, made up of other players and the Kings that rule them and at the lowest level kingdoms can work together to try and complete the World Wonder to win the game. However, more often than not multiple kingdoms will band together (up to 7 maximum) to form an Alliance with the same objective, meaning entire Alliances can go to war creating large-scale conflicts for all players and kingdoms involved.